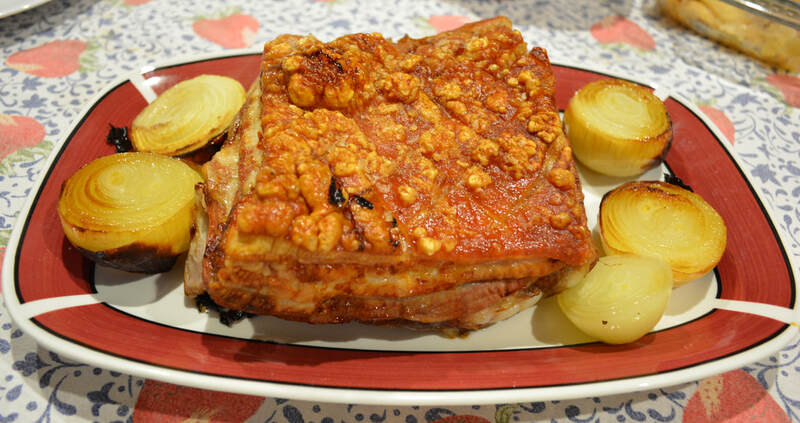 The other day I was at the butchers buying meat that I needed for dinner when I spotted this piece of pork belly, it was nice and lean and looked amazing, so I bought it for the following nights dinner. After many years of trying different recipes, using different oven temperatures, all failing to produce the crackling that I crave for, crispy and crunchy I have finally found a method that makes the perfect crackling. Each bite of the crackling is amazing, I love the sound it makes. And the meat, super moist, super tender, perfect. I am sharing with you today the only way I will ever bake pork belly for the rest of my life, because it works. 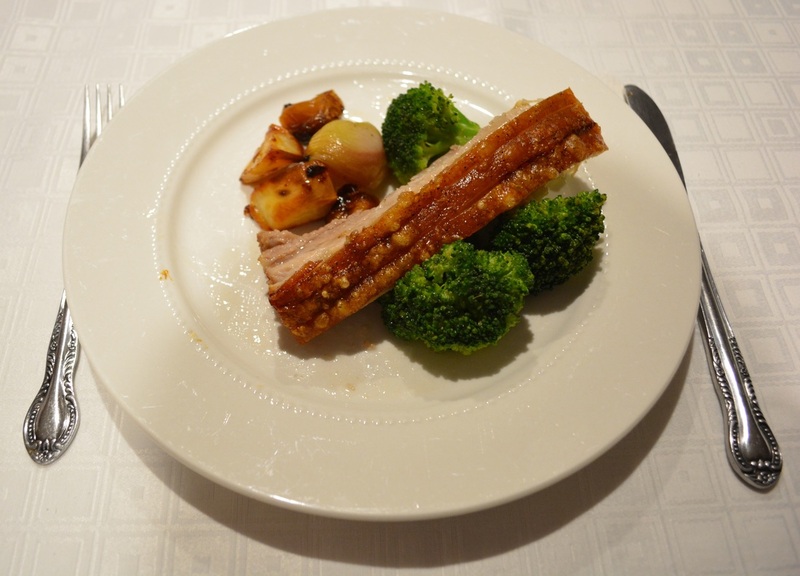 I find using pork belly on the bone gives juicer meat, but you can do it with a piece of pork belly without bones also. Adding herbs to the dish adds a little extra flavour. I quite like sage or thyme with pork. If you want to roast potatoes with the pork belly do it in a separate baking dish, as I found the potatoes burnt too much when I placed them under the grill with the pork. When you take the pork out of the oven to rest, increase the oven temperature if the potatoes aren't quite ready and need more cooking. Once you have turned on the grill, do not look away from the pork, the pork will blister and get crispy very quickly and if you look away, it can go from beautiful crispy crackling to burnt inedible crackling in minutes. So if you want to make perfect roast pork, try this method. It's so good. Get your butcher to score the skin of the pork belly if it isn't already as they have far sharper knives than we do and do it with ease. Take the pork out of the refrigerator at least 1 hour before baking, leave it uncovered on the kitchen bench so the skin dries out a bit, pat dry with a paper towel if there is any moisture on the skin. Preheat your oven to 180C/160C fan forced. Drizzle 1-2 tablespoons of olive oil in the base of your baking dish. 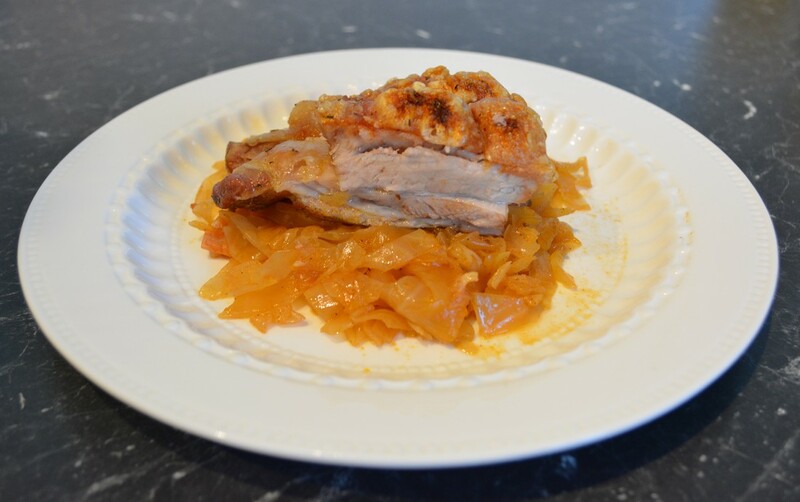 The onions and garlic are used to provide a base for your pork to sit on. 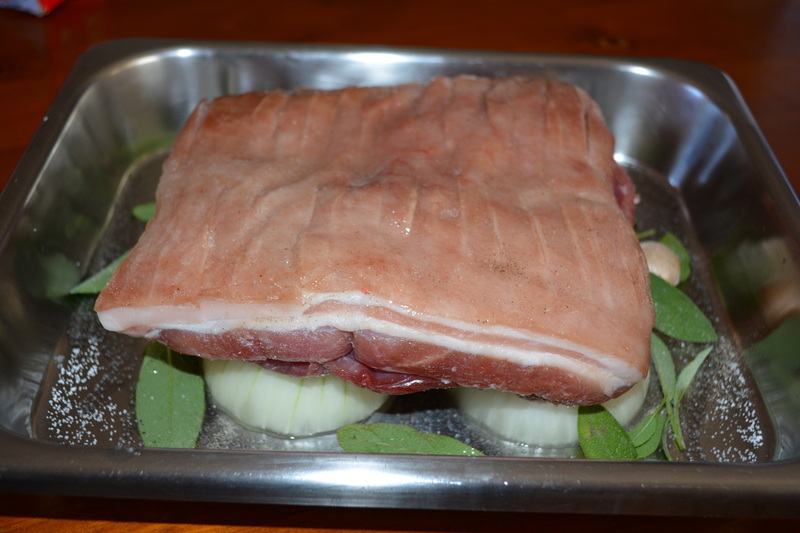 So arrange the onion discs and garlic in the centre of your baking dish, so it is the size of your pork belly. Place the sage or thyme down around the onion and garlic, if using. Season the pork all over with salt and pepper. Place the pork belly skin side up on top of the onion and garlic. Drizzle 1 tablespoons of oil on top of the pork skin, rub it in all over the skin. The pork should be in the centre of your baking dish. 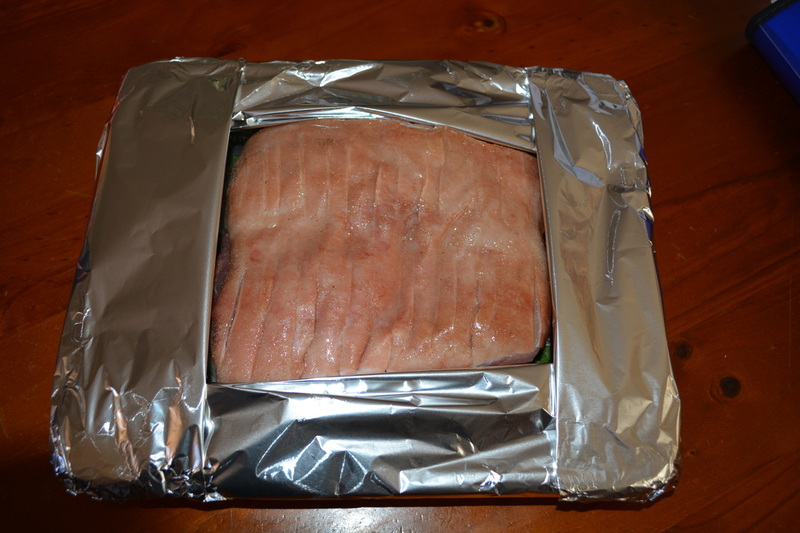 Cut 4 thin strips of aluminium foil about 5-10cm wide, you need to cover the sides of the baking dish (around the pork) with aluminium foil, leaving only the pork skin exposed. So all you should see is the pork skin. Place in the oven and bake for 2 hours. After 2 hours remove the aluminium foil, bake for a further 30 minutes. Turn your oven off, and put it on the grill setting now. This step needs to be watched carefully as if you don't watch it carefully it can go from crispy skin to burnt skin in no time. Grill for about 5-10 minutes or until the skin is blistering and perfectly cooked. Take the meat out of the oven, allow to rest for 5 minutes before slicing and serving. 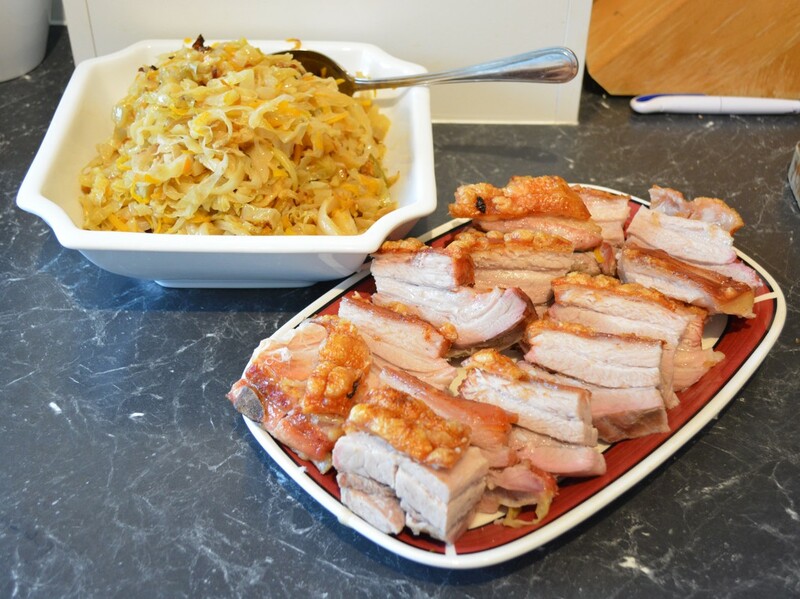 I like to serve the pork belly with sauerkraut, or with some roast potatoes and broccoli salad.